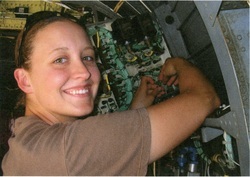 Andrina was involved in the Afghanistan war and deployed twice. First in 2005-2006 and then again in 2010-2011, she served as a Specialist in the National Guard. She told some funny stories about pranks they would pull on each other; she also talked about what her job was once she was on duty. She got to tell me what she did when she was on leave. She also told me how she stayed in contact with her family. At the end she talked about her officers as well as friends she made in the National Guard. She also talked about her injury and how she traveled back home. Andrina Thornton was born January 23rd, 1983, in Pendleton, Oregon. During her youth she moved to Newburg, Oregon and continued her schooling there. As she grew up she went to high school in Yamhill/Carlton, Oregon. During her high school years, she moved back to Pendleton and attended high school at Pendleton High School (PHS). Throughout her high school years, she participated in sports including Volleyball, Basketball and Cheerleading. Andrina graduated from Pendleton High School in 2000. After graduating from PHS, Andrina attended Blue Mountain Community College (B.M.C.C) in Pendleton. After her first semester of college, she realized how expensive college life was. She made the decision to sign up for the National Guard. On January 2nd, 2003, she enlisted in the National Guard. Andrina took many classes while in the National Guard. She said in a newspaper article, “It took me six months to learn my job, and I love it!” She is an electrician on the Chinook helicopters as well as other aircraft. For a while, she was the only woman electrician in the shop, the field she was in was very male dominant. Andrina's highest rank is a Specialist and she has been a member of the National Guard for 12 years. She has been deployed to Afghanistan twice, the first time for 16 months and the second time for just under 13 months. Andrina is just now getting the opportunity to attend college. She is attending B.M.C.C., where she is a full time nursing student. There is a chance she may be deployed yet again in 2015. Andrina is an amazing solider; she has been in the National Guard for 12 years, has 5 kids, a wonderful marriage and is getting a college education.